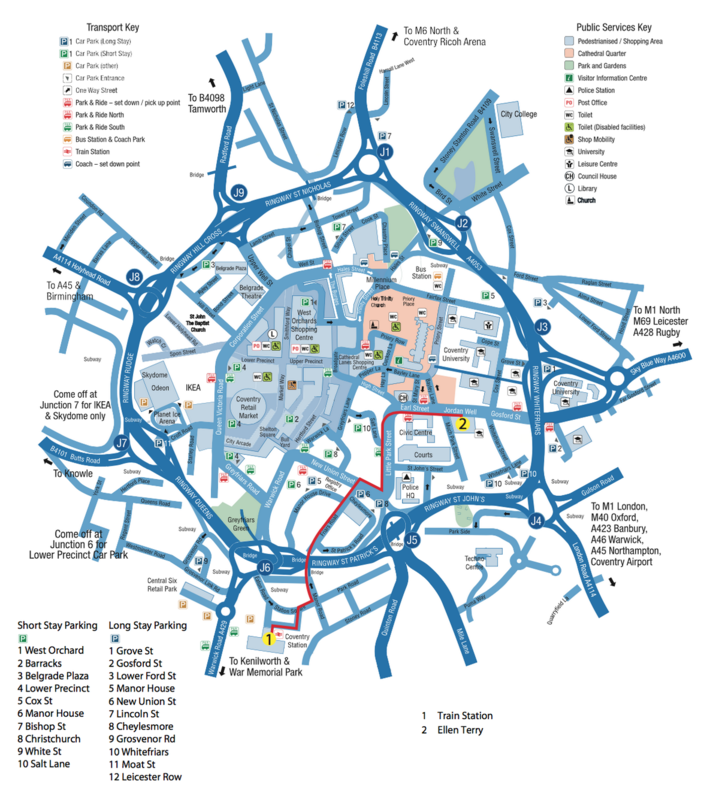 If you are planning on driving, Coventry is easily accessible from the M40, M42, M5, M6 (and M6 toll), M69 and the A45 and A46. We recommend using a route planning service such as Google Maps to plan your journey ahead of schedule. If you are using a sat nav the postcode for the Ellen Terry building is CV1 5RW. 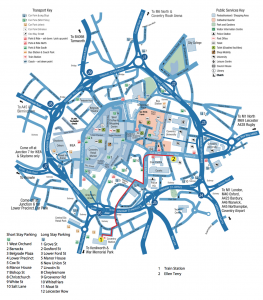 Further information regarding travel by road and the postcodes of nearby public car parks can be found on the Coventry University downloadable campus map, available here. For information about bus services please visit National Express. For information about bus services please visit National Express. Once in Coventry you can easily catch bus numbers: 8, 8A, 9, 9A which take you from Coventry Rail Station to near Coventry University for £1.00. Make sure that the bus is going to the stop Whitefriars, Gosford Street which is only a corner away from the Ellen Terry building (pictured, below). Getting to Coventry Rail station is very easy from Birmingham New Street Station. The duration of the journey is 20-30 minutes and there is at least one service every 15minutes. 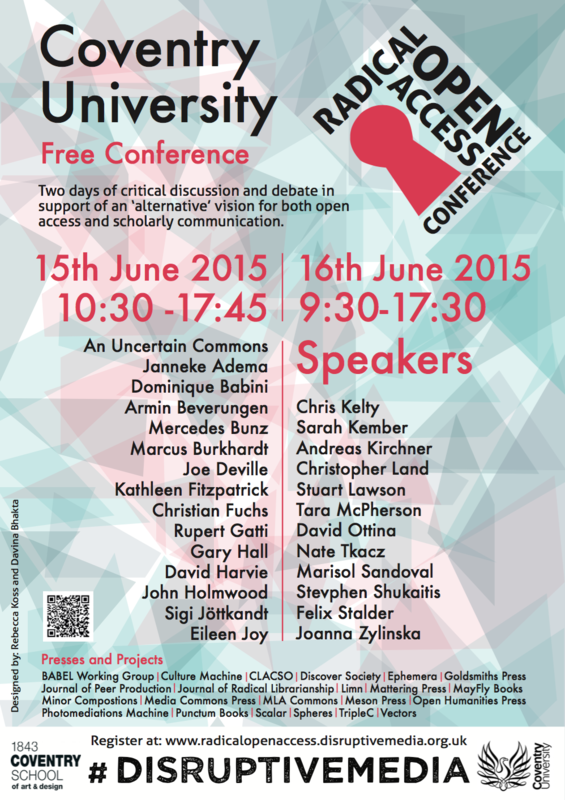 If you are an international postgraduate or early career researcher and would be interested in attending the conference there are regular trains to Coventry direct from Birmingham International Airport. Once at BHX (Birmingham International Airport) you can choose to catch the train, coach or bus service to Coventry. By train: from the Arrivals you should proceed to the shuttle service to the train station, which is well sign-posted. Once at the Rail Station in the airport, the journey to Coventry is about 10mins long. By coach: if choosing the coach service to Coventry Pool Meadow Bus Station you should consider buying the tickets online through http://www.nationalexpress.com/home.aspx . The journey takes about 20mins. By bus: the bus service 900 or 900A runs every 20mins from the bus stop in front of Departures. Birmingham International Airport offers services to over 110 countries worldwide – for more information please see here. The campus of Coventry University itself is located in the middle of the city centre, less than 15 minutes’ walk from the railway station and 5-10 minutes’ walk from Coventry Pool Meadow Bus Station, making travel between accommodation and restaurants extremely easy as everything you need is in walking distance. There is a variety of global cuisines available to suit your tastes. If you would rather travel by taxi between the station and campus a single journey will cost you about £4, please ask to be dropped at the Ellen Terry building on Jordan Well.